The Delaware, Lackawanna & Western operated an extensive commuter service out of its waterfront terminal in Hoboken to the suburbs of northwestern New Jersey on its Morris & Essex division. Extensive grade separation projects at the turn of the last century allowed dramatic increases in speed and safety. In 1930, the Lackawanna electrified its suburban commuter routes using a 3,000v DC overhead catenary system. Because of their ability to quickly accelerate between frequent stops, they were able to cover the schedules much quicker than the old steam-powered trains. Car 2628 was built in 1930 by Pullman as part of an order of 141 electric multiple-unit commuter coaches. These cars are self-propelled, drawing electric current from an overhead wire. An extendable pantograph slides a collection shoe along the contact wire. The pantograph is designed to be flexible to differences in height, yet maintain constant tension against the wire. Wide aisles, vestibules, and steps helped speed up passenger loading and unloading. Coach exteriors were finished in deep olive green, with interior walls painted light buff above the windows, and green below. Ceilings were a light cream color. Rattan “walkover” seats allowed the passenger to choose which way he was facing. A fleet of 141 non-motorized trailers were paired up with the 141 powered coaches. The cars were built upon a copper-bearing steel frame, using aluminum panels for the roof and interiors to save weight. Air conditioning was never an option on these cars, instead commuters sought relief from either the small circulating fans installed overhead or by opening the window. Operating cabs were built into the ends of each pair of cars. Air operated windshield wipers and defrosters helped maintain visibility for the engineer. Railroads were never in a hurry to provide new equipment for their commuter services. They were already a very labor and capital intensive service, and new cars were just not in the budget. With the high reliability rate of electric equipment, there was little reason to contemplate replacement. Our DL&W 2628 soldiered on and served generations of New Jersey commuters with little change over the years. After the 1960 Erie Lackawanna merger, the car was renumbered 3628. When Conrail took over operation of the former EL lines, the car was renumbered 4628, to avoid conflict with a series of GP38’s with the same numbers. After a number of years of public debate over the idea of public subsidy for commuter services, the New Jersey Dept. of Transportation began a program of purchasing new equipment and subsidizing rail service in the 1970s. While other lines enjoyed new coaches and air-conditioned comfort, the Depression-era Lackawanna MU’s were viewed as quaint antiques that needed to be replaced. Aside from some experimental paint schemes, the electric MU’s were operating almost exactly as delivered. 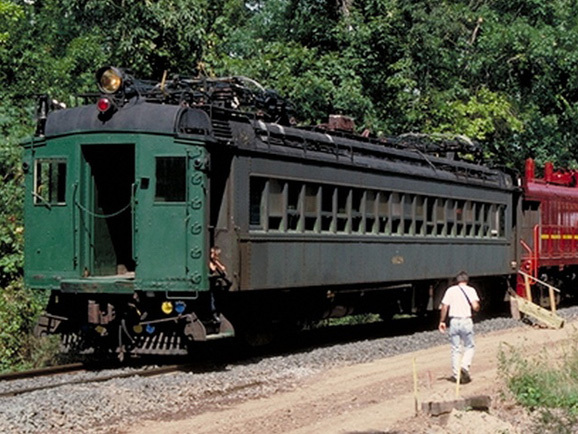 A major stumbling block was the Lackawanna’s electrical system, which was not compatible with the former Pennsylvania lines operated by high-voltage AC current. There was no sense in buying new equipment that would be held captive to a single route. After much discussion, it was decided to convert the former Lackawanna lines to high-voltage AC by 1984. In 1983, NJ Transit assumed direct responsibility for operating and maintaining the state’s commuter services. Our 2628 has the distinction of being the last car on the last train of former Lackawanna MU’s to depart Hoboken Terminal. On August 24, 1984, Train #429 rolled into the history books. Because the fleet of power cars and trailers were still in reasonably good condition, many of these classic Pullman coaches found new homes on tourist railroads across the country. Our 2628 was purchased from an equipment dealer in February 1985 for $3,500 by a group of Rochester Chapter members. For more than 20 years, our Lackawanna MU car was on display in Industry Yard, showing our visitors a typical mid-century commuter coach. Unfortunately, the years have not been kind to our car. The weight-saving materials used in the roof caused a reaction between the dissimilar metals and weakened the supports. The roof of our coach has suffered a partial collapse, exposing the interior of this car to the elements. We are currently seeking donations to allow us to stabilize the car and protect it from further deterioration. Please contact a museum manager if you can help. Was the last car of the last train of former Lackawanna MU cars to depart Hoboken Terminal on August 24, 1984.